a <dp:input.mapping> is needed to prevent the stylesheet from parsing its (Non-XML) input as XML. Recently quite some of our IBM Böblingen lab L2 and L3 support DataPower boxes where reinited, and stuff was cleaned up. 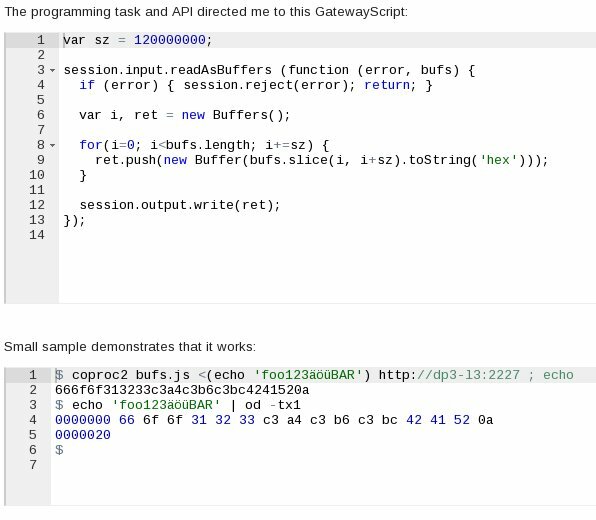 I wanted to know on which appliance coproc2gatewayscript service was installed, and that listens on port 2227. Below small bash script avoid having to login to each box and inspect services installed. Mathias Bynens: "Asynchronous stack traces: why await beats Promise#then()"
Last blog posting was on using async await. I just stumbled over Mathias' nice blog posting explaining why using "Promise#then()" is worse than "await", both runtime as well as memory wise. This applies to GatewayScript as well. I used <dp:url-open> against an unreachable target with timeout specifying the delay in seconds. I misused "xc10:" target with <dp:url-open>" to get millisecond precision delays. There is no built in delay for good reason -- be careful with what you do! It turned out that nothing special is needed for DataPower GatewayScript, Jeff's posting directly works! "await wait()" needs to be run inside an async function -- I just made the readAsJSON callback async. I did choose readAsJSON() because GatewayScript implements JSON rfc7159 allowing any top level element, here a number. Next I wanted to make use of this synchronous wait in DataPower XSLT as well via "dp:gatewayScript()". In blog posting "How to generate UUID in GatewayScript"
I proposed to use transform.xslt() and call out to "XSLT dp:generate-uuid()". Some months ago I was asked whether there is an XSLT function that converts JSON to JSONX. I responded that DataPower convert.-http(JSON) action or service request type JSON are required to convert JSON to JSONX. At least the encode-uri would have been far more difficult to do in XSLT than in GatewayScript. DataPower allows processing of XML processing in all ICU supported encodings. In my response I showed a Non-XML stylesheet solution, which is required for all ebcdic type encodings. Customer came back that his appliance misses DataGlue license needed for processing Non-XML (DataPower proprietary) stylesheeet. Next you select codepage layout table rows "00" to "F0" comletely and copy them. Then you open LibreOffic Calc, create a new spreadsheet and paste your clipboard. Calc will recognize your data and create rows 1-16 and columns A-R from it. First you delete column R (not needed), but keep not needed column A (that will generate needed commata later). Now you select area B18-Q33, then Edit->Fill->Down and then Edit->Fill->Right. Next you check for conversions that did not work, P25 in our case and replace by correct value you lookup in codepage layout as 0x003D for codepoint 7E. Finally you save the document with delimiter ',' and empty text delimiters (no quotes). Then you take the last 16 rows of that file into your C or GatewayScript program for defining a 256 character mapping array. The two boolean variables determine whether base64 encoded or raw IBM01141 encoded data is processed, and whether the decoded result will be returned as is, or will be XML parsed. As you can see the result is UTF-8 encoded, and therefore Non-XML (wrong@encoding in XML declaration). That is the reason why XML.parse() has to skip the XML declaration to successfully parse as XML. // Conversion from unicode base plane to UTF16LE is really simple. In 2015 I blogged on DataPower Languages, and how to call from one of DataPower languages out to others (GatewayScript, XSLT, XQuery, XPath, Schema). In 2016 I blogged on Using XPath 1.0 and XPath 2.0 in GatewayScript, which demonstrated how GatewayScript called out to XSLT that called out to XQuery allowing XPath 2.0 evaluation on XML in GatewayScript not available otherwise. In the solution there were three static files: GatewayScript script, XSLT stylesheet and XQuery script. Last August I answered developerWorks forum posting Dynamic XQuery on how to execute dynamic XQuery from XSLT. A customer wanted to determine all (defined) context variable names in GatewayScript. I do not know the reasoning for that request, but here is a solution. First, the variable names of any context in a DataPower transaction are stored in "var://local/_extension/variables". GatewayScript can only access "var://context" variables, but not "var://local:" variables. So GatewayScript has to callout to a stylesheet doing the job. pako is under MIT license, so you need to decide whether that is acceptable for you. "dist/pako.js" does some requires to other moduls in that archive. So I tested with "pako.min.js" which is self-contained. "echo" generates a new line terminated string, containing German umlauts and an emoji. That string gets piped to gzip which compresses the string, and send to console. The surrounding <(...) subshell provides that output as file to coproc2 tool, that executes gunzip.js with that compressed data on DataPower. As can be seen the original string gets returned. DataPower XSLT compiler does provide dp:inflate() and dp:deflate() functions for different algorithms, including "gzip". But a call out from GatewayScript via transform.xslt() does only help for xs:string data, a sequences of XML characters, and not arbitrary binary data. Anyway, pako.min.js provides provides working "pako.ungzip()" for GatewayScript. Of course thorough testing is needed if you plan to use it in prod. Exercise to the reader, install "pako.js" and its required modules on "local:" and debug why pako.gzip does illegal access. I did such things myself more than 20 years ago for performance reasons. But I disagree with "thus simplifying maintenance" in Wikipedia article. The result was compiler error "Code generation from strings disallowed"
Reason for this is same as why GatewayScript disallows "eval" command: prevent injection attacks. Customer task was simple, how to hex encode >1GB of binary data efficiently in GatewayScript. GatewayScript strings are restricted by 256MB in length, and even "buffer" object is restricted by 1GB in size. Today is Pi day (3.14), and I wanted to do "something" Pi related with GatewayScript. So for doing any "precision" computing with GatewayScript arbitrary precision numbers are needed. I gave that library a try, downloaded the .zip, and uploaded "decimal.js" to "local:" folder of DataPower. Yes, slow convergence for the chosen formula (there are much quicker converging formulas). But good to see how easy arbitrary precision math can be done in GatewayScript based on a library with acceptable license for most. have not been implemented widely due to their complexity. In developerWorks DataPower forum posting customer asked how to deal with them. Despite saying just "not supported", I mentioned that a service implementing XInclude could help in cases where a URL is needed that should specify a XML file -- just reference the service, and that will return the expanded XML. So this blog posting is on stylesheet xinclude.xsl I have implemented to do simple XInclude processing with depth/loop protection. Why simple? The only feature implemented is following the "href" attribute, but either that's already OK for you, or you can use xinclude.xsl as starting point and add other spec features.